While you can surf safely in a wave pool knowing there’s no risk of shark attack, like most threats the biggest danger comes from a microbe. In the wake of the Waco wave pool death (note: BSR has not been confirmed as the source) surfers are asking how safe is it to go surfing in a wave pool? The tragic death of Fabrizio Stabile has turned the world’s attention to the wave pool boom and questions of safety as the rather obscure Naegleria fowleri, or brain-eating bacteria, becomes a socially followed hashtag. There are no effective medicines to fight Naegleria fowleri infections and the condition they cause called primary amebic meningoencephalitis or PAM. There is the consensus that with global warming the bacteria will proliferate even more. In this comprehensive guide, we’ll shed light on what it is, where to find it, its symptoms, how to avoid it, why it’s everywhere and why you shouldn’t cancel your next wave pool trip. What are the brain-eating bacteria? First identified in Australia in 1965, the amoebas thrive in the USA and around the world. There are several species of Naegleria. It’s only the fowleri subtype that is dangerous to humans. Naegleria fowleri loves freshwater ponds, lakes and rivers. The amoebas thrive in very warm water. The amoebas live in the soil and scum layers of warm freshwater bodies. When this layer is stirred up, the amoebas float freely through the water. Like most amoebas, these guys reproduce by cell division. When conditions aren’t optimal (too cold) they remain inactive. When things heat up they transform into trophozoites which are the feeding form of the amoeba. This is when things get dangerous. Are There Brain-Eating Bacteria Hot-Spots? While cases have been reported as far north as Minnesota, it’s Texas and Florida that claim the most incidents. Between 1962 and 2017 the two southern states saw 35 infections in each state. The CDC said that each summer their department fields calls from doctors across the US. The perplexed physicians are looking for answers to primary amebic meningoencephalitis or PAM cases. Naegleria fowleri is a big chunk of the agency’s Waterborne Disease Prevention Branch’s (WDPB) focus. The agency serves as the main resource for doctors and health departments around the country who phone in each season when stymied by a patient’s condition. Is the Brain-Eating Bacteria Everywhere? According to Dennis Kyle from the University of South Florida, the amoeba is everywhere. He told the Sun Sentinel that a sampling of South Carolina lakes revealed 20-to-50 of the amoeba per liter of water. “It’s everywhere,” said Kyle, who added there was no reason to think Florida and other very-warm-water lakes would be different. Any freshwater body can carry an increased risk of contamination simply by having that elevated temperature. But encountering the bacteria is random, like being struck by lightning. The study used previously published data and the codes from death certificates of known PAM case-patients. They then selected codes from any location on the death record, not strictly the primary or immediate cause of death. If PAM is such a danger, surely it would have shown up in similar freshwater lakes, ponds and pools, like in a wakeboarding cable park. No. It hasn’t. We asked Unleashed Wakeboard Magazine publisher Philippe Sirech if any wakeboarders had ever died from Naegleria fowleri. 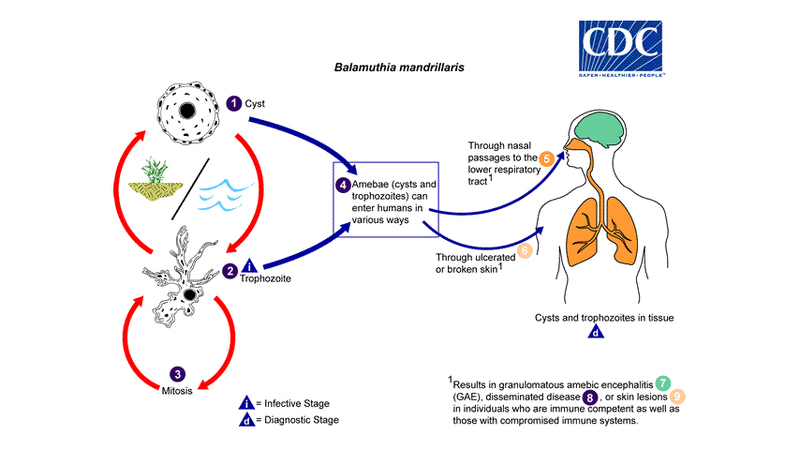 From lake-to-brain, how Naegleria fowleri infects people. How Does the Brain-Eating Bacteria Kill People? According to the CDC Naegleria infections and PAM, may also occur when contaminated water from inadequately chlorinated swimming pools or heated and contaminated tap water enters the nose. There are a few cases where using yeti pots led to exposure. 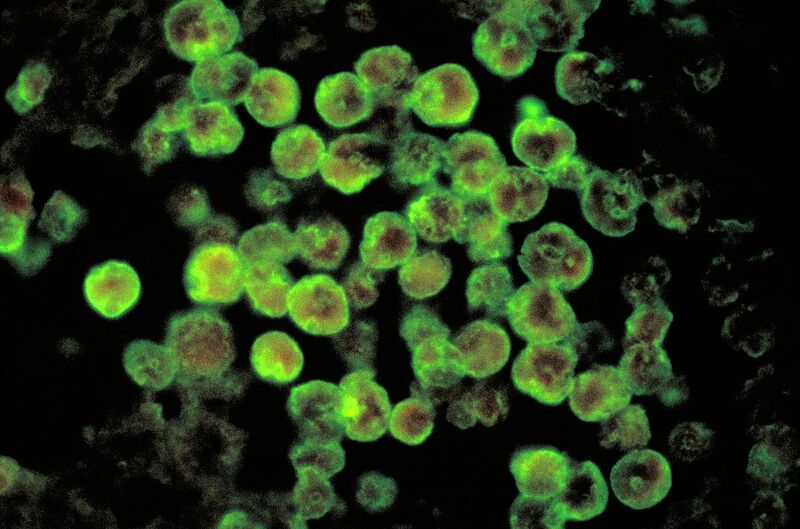 The CDC says symptoms appear within ten days after exposure to the deadly amoeba. Tragically, they report that in all but a small number of cases, death follows in a few days. First symptoms appear one-to-nine days after exposure and mimic a common cold. Headache, fever and nausea are later replaced by a stiff neck, confusion, loss of balance, seizures and even hallucinations. Once symptoms appear death usually occurs within two weeks. What happened to Fabrizio Stabile is a textbook example of the above symptoms. “While Fabrizio was mowing his lawn on the afternoon of Sunday, September 16, he suddenly experienced a severe headache and went to lie down,” said the Fabrizio Stabile Foundation web page. What Regulations Are In Place to Protect Me From PAM? Local authorities in most counties will test water they find suspicious. This is just like at your local beach where water is frequently monitored to ensure it’s safe for human contact. It’s simple and straight ahead, but gets compounded when you factor in private wave pools. Doug Coors’ NLand facility in Austin Texas had a well-publicized delay when local authorities insisted that the facility be classified as a public pool, which would have meant chlorinating the giant freshwater Wavegarden lagoon. Of note is that Kelly Slater’s wave pool will remain private, invite (and waiver-signing) only, thereby skirting any county water quality regulations. So How Do We Keep Wave Pools Safe In the Future? The pond guy, a popular pond blog with 60K subscribers says that just like yogurt is for your gut, “good” bacteria is always a better option to chemicals. The general idea is that good bacteria eat the decaying organic matter that breaks down into a fine silt that is perfect for harmful bacteria. While this system works on a very small scale, it would get overrun quickly when you put a dozen sweating, wave-hungry surfers in a smallish enclosure. Also, consider that the bacteria prefer the bottom silt of a body of water. The agitation of wave-action would frequently stir up the bottom. In researching this story we spoke to one source who said that BSR Cable Ranch “zaps” their water regularly to clear harmful bacteria. Whether they do this with electricity or ultraviolet light, the source was uncertain. But also keep in mind that the brain-eating amoeba has been found in poorly chlorinated pools and tap water. So it’s not correct to say that pond scum is the only way to come in contact with Naegleria fowleri. We did find that the reason for the odd bluish color of the water at BSR: it’s dyed. A 2016 Express News story explained that since the attractions are built on human-made lakes and dug into clay soil, the water would normally have a gray color. How Do I Avoid Brain-Eating Bacteria? To protect yourself from Naegleria fowleri, you need to know that the bacteria like the silt on the bottom of ponds, very warm freshwater and that they attack you by entering through the nose. 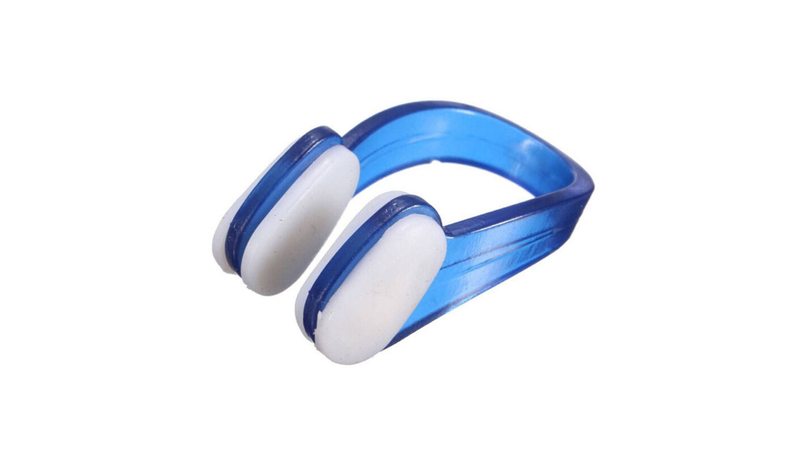 Therefore, by wearing a nose plugin not-too-warm water and not sticking your face on the bottom of a pond and inhaling deeply, are all good safety measures. The CDC also offers this advice to avoid brain-eating bacteria. But the CDC discloses that none of the recommendations are scientifically proven to prevent getting PAM. “These recommendations make common sense but are not based on any scientific testing since the low numbers of infections make it difficult to ever show that they (the above safety precautions) are effective. The Takeaway: Is It Safe to Surf a Warm, Non-Chlorinated Wave Pool? In Florida, health officials estimated that there is only one case for every 2.5 million hours that people spend in freshwater. The amoeba has to enter the body in a very specific way (the nose) in order to be dangerous. If the water is chlorinated or not abnormally warm, the bacteria won’t flourish and you won’t be at risk. Fabrizio Stabile’s death is a very rare and tragic occurrence. Every year there are a few deaths like his and there is no way to prevent it 100% other than staying out of the water. It’s similar to being struck by lightning. Yes, you can take measures like not carrying a metal rod during a thunderstorm, but you still might get struck. Every day we all take different measued risks, from driving your car to going to the bathroom (there were 43,000 toilet-related injuries in 1996). And while there are some measures you can take to stay safe, at the tend of the day there is nothing to shield you from the lightning. In the meantime, let’s hope a water-testing method and brain-eating bacteria killing water purification method launches soon.